This is a pack of two optional Avid RC 12mm "Batch3" Buggy, Red - 3.33lb Front Shock Springs, and are intended for use with the Team Associated 12mm Big Bores, Team Losi Racing 22, Kyosho RB5 and RB6, Durango DEX410, DEX210 and the Team Associated B4/B44 V2 shocks converted for big bore springs (Avid spring cups AVD1012 and collar adapters AVD1014 required). With the use of the Team Associated +9 offset big bore spring cups (ASC91310), these springs will also fit the Team Associated SC10 and T4/T4.1 front shocks. The labels are custom printed to show the average spring rate (in lb/in) for each batch of springs after they’ve passed Avid quality check. 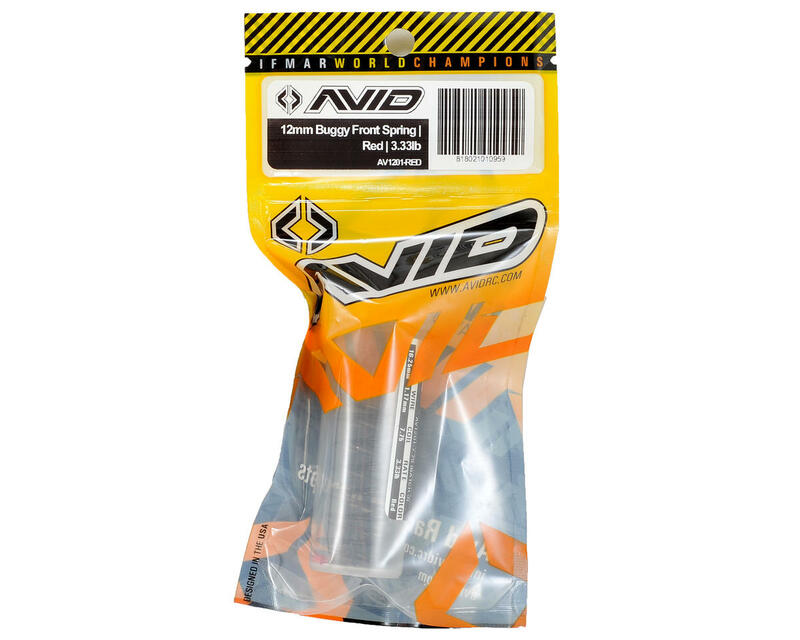 Avid ensures that the labeled rate on the packaging is as close as possible to the springs you are getting inside the bag. Avid springs are checked in-house with precision spring testing equipment. 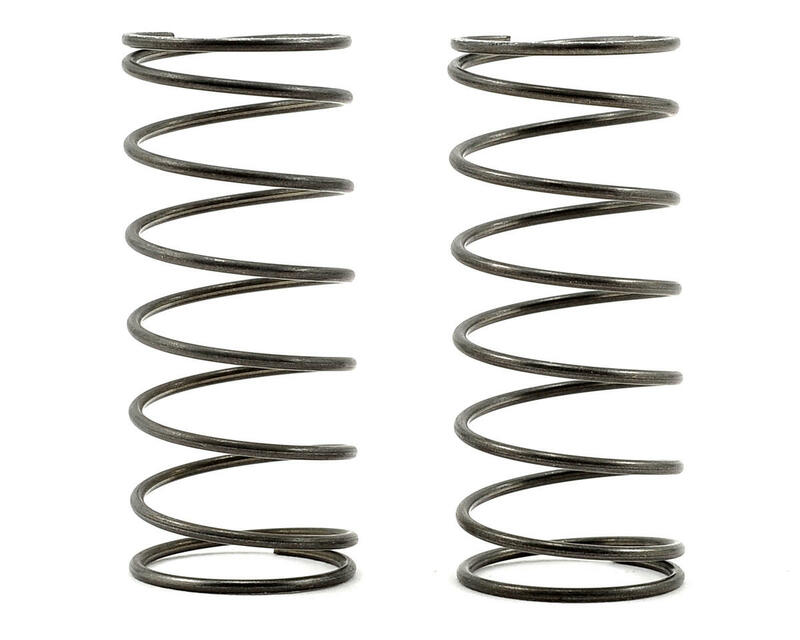 Avid springs are raw, un-coated ASTM spec spring wire which ensures consistent spring rates and prevents mis-matched spring pairs. They are easily polished for a “factory” look. Traditional coated springs have a powder coating to protect the wire, but the coating differs in stiffness from the wire. Vendors normally have to compensate by adjusting the wire diameter and number of coils, but as the powder coating breaks down, you’re left with a spring that isn’t the same as when you installed it. Each pair of springs comes with pre-cut colored shrink tubing if you prefer to identify them by color. Avid suggests to locate the tubing on the third coil from the bottom as to not interfere with the compression of the spring into the shock body or spring cup. Don’t over-do it, polishing your springs weekly, because each time you polish the wire you are removing a small amount of material. If you are racing in a wet environment, promptly remove springs after race day and wipe down with WD-40 to remove moisture. Don’t store your car wet. As the standard small print, Avid is not responsible for rust on springs. If you care for them properly, the springs should last through the racing season. As a rule of thumb, Avid does recommend replacing springs every year to ensure peak performance. Throughout a spring’s life, the performance can degrade after a significant number of compression/extension cycles. This is reduced in an Avid spring which has no coating, but it is still unavoidable.